Chess was the knight’s idea. Death, who likes multiplayer Euros rather than 2-player abstract strategy games, would have preferred The Settlers of Catan, if for no other reason than that its original German title begins with the word ‘die’. Iconic Ingmar Bergman existential drama remains interesting if not wholly profound. 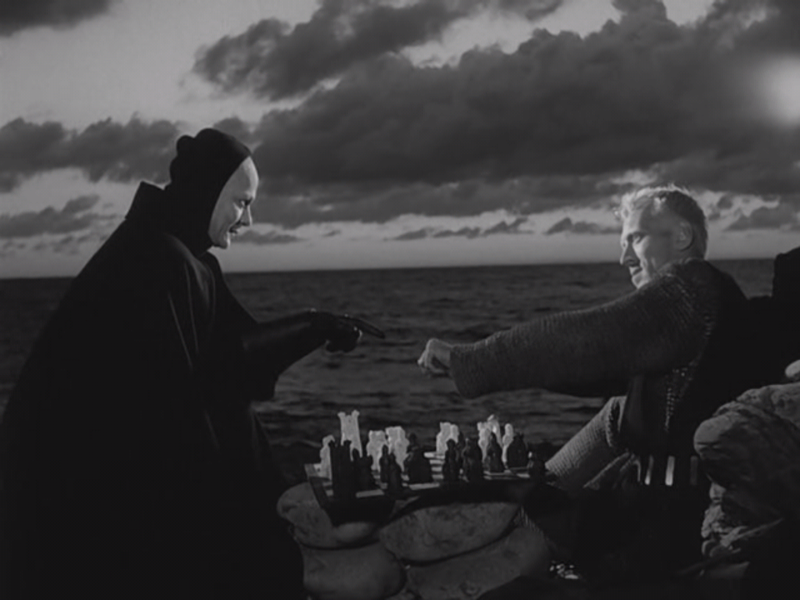 Bergman uses the metaphor of a knight playing a game of chess against Death (who cheats, of course), and a medieval setting full of death and injustice and apocalyptic panic (or in some cases, nonchalance), to explore questions of the existence of God, his silence in the face of suffering, the meaning (or meaninglessness) of life, and the inevitability of death. Though I enjoyed much of the film, particularly the exploration of these questions and themes, I didn’t find it emotionally engaging; it didn’t move me, which is precisely what a movie with this premise and ambition should do. Still, there’s some excellent work from Max von Sydow (as the knight), Bengt Ekerot (as Death, a performance that continues to influence how personifications of Death are portrayed to this day) and Gunnar Björnstrand (as Jöns, the knight’s squire), some memorable images, and occasional flashes of solid black humour. This entry was posted in 1957, 7.5, Reviews and tagged Bengt Ekerot, Board Games in Movies, Chess, Drama, Existentialism, Fantasy, Film, Gunnar Björnstrand, Ingmar Bergman, Max von Sydow, Movie Reviews, Movies, Swedish Film, The Settlers of Catan, The Seventh Seal on May 1, 2014 by moviesandbacon.